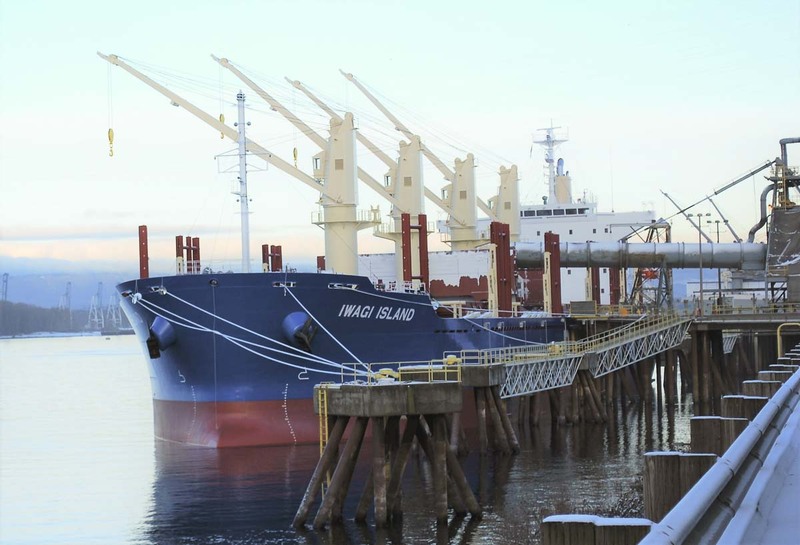 VANCOUVER — The Port of Vancouver USA welcomed the Iwagi Island, commanded by Capt. Yi Hai Yu of China, on her maiden voyage Feb. 15. Capt. Yu and his 17-member Chinese crew were welcomed to the Port of Vancouver by representatives from Kinder Morgan Bulk Terminals, Cascade Marine Agencies Ltd. and General Steamship Agencies. The Iwagi Island is a 590-foot-long Handymax bulk carrier built in Imabari, Japan. She is owned by Iwagi Island Limited and operated by Pacific Basin Shipping (HK) Limited. Handymax bulk carriers typically have a deadweight capacity of up to 60,000 metric tons and are used to transport cargoes like cement, steel, lumber and mineral ores. The Handymax bulker is a versatile vessel; due to their size and configuration, they can be used to carry nearly any dry bulk cargo and can load or unload at a variety of ports around the world. The Iwagi Island departed Japan for the U.S. in January 2019. She will load approximately 26,000 metric tons of copper concentrate at the Port of Vancouver USA before departing for ports in the Black Sea. The Port of Vancouver USA is one of the major ports on the Pacific Coast, and its competitive strengths include available land, versatile cargo handling capabilities, vast transportation networks, a skilled labor force and an exceptional level of service to its customers and community. For more information, visit us at www.portvanusa.com.